The theatre and dance course of study is well-integrated, balanced, and challenging, combining studio and classroom work with frequent design and performance opportunities. As artists in a liberal arts environment, we are committed to a well-rounded education informed by multiple disciplines. 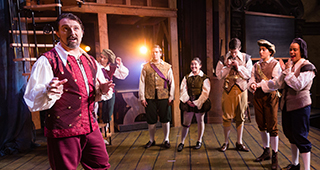 The Rollins College Department of Theatre and Dance believes that theatrical productions and classroom study are of equal and complementary value. Additionally, we embrace the liberal arts mission of Rollins College. The study of theatre comes most fully to life when integrated with other disciplines, such as psychology, English, sociology, art, music, and history. Students are encouraged to explore the rich variety of courses on campus. As a Bachelor of Arts program in a liberal arts environment, we believe in a common set of courses that serve as a foundation for the study of theatre. In addition, students select an area of concentration to hone skill sets in the area of directing, design and technical theatre, dramaturgy, musical theatre, perfomance, and theatre studies. Directing: Develop the skills necessary to lead a team of artists in executing a shared vision. Design/Tech: Develop expertise in the areas of scene, lighting, costume, and sound design. Dramaturgy: Explore various ways to bring productions to life on stage. The role of a dramaturg can be varied, from working with playwrights on new scripts, to working with directors and designers on historical accuracy, to providing research for character development to actors. 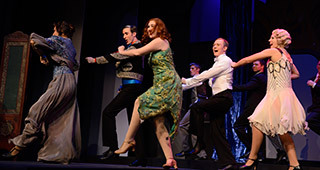 Musical Theatre: Combine performance and dance courses with courses from our friends in the Department of Music. Performance: Explore a variety of approaches to acting while learning to effectively utilize the body and voice. Like all liberal arts, dance teaches life skills that will benefit the student later in life, regardless of the vocation selected. Plato once wrote, "to sing and dance well is to be well educated." He considered the uneducated man achoreutos or "danceless" and the educated one kechoreukos, "endowed with dance." It is our mission to endow students with dance.